↪Bubbling Mass No. 1, 2013. Installation detail. Plinth, enclosed mechanisms, paint and water. Bubbling Mass No. 2, 2013. Installation detail. Plinth, enclosed mechanisms, paint and water. ‘Bubbling mass’ 2013 is a small amorphous bubbling mass continually renewing at the same rate as it dissipates. The object resists form, adjusting and rearranging itself yet always maintaining is inherent geometric precision. The viewer is left to consider if this could this be some kind of chemical reaction, or a material undergoing a transformative process. Is this the remains of a dissolving object? Or the beginnings of a new emergent form? The work is made possible through a concealed air pump, hidden within the plinth. Its appearance is determined by the viscosity of the liquid and the flow rate of the air that creates the bubbles. Increased viscosity creates larger bubbles whereas thinner liquid creates smaller bubbles. 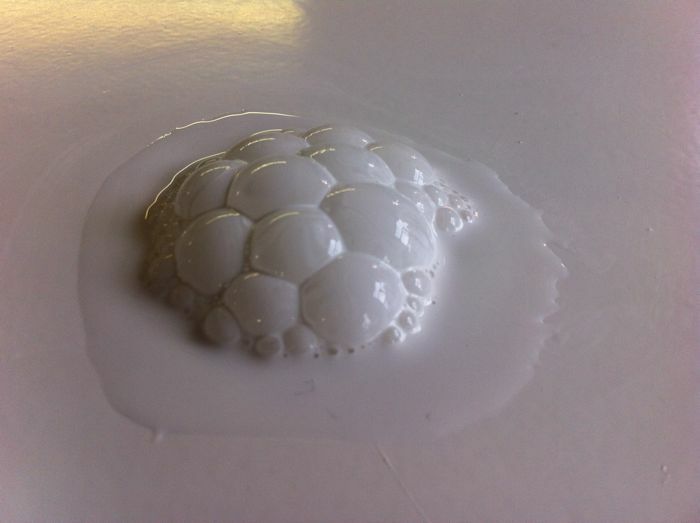 The rate at which the mass grows is governed by the air flow that generates the bubbles but humidity effects the lifespan of each of the bubbles (just a few seconds) and over a longer time period, humidity also affects the viscosity of the liquid which slowly increases. 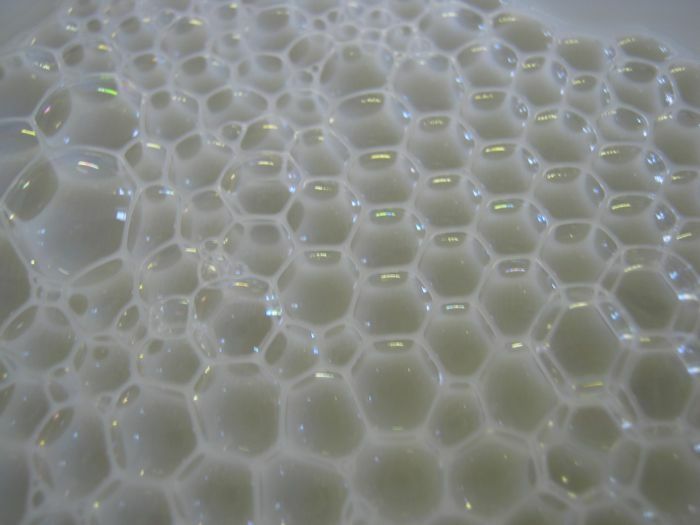 The original was made using milk, it creates exactly the right kind of bubble that lasts just long enough, soap made bubbles that last too long, meaning the mass would grow and expand too far. 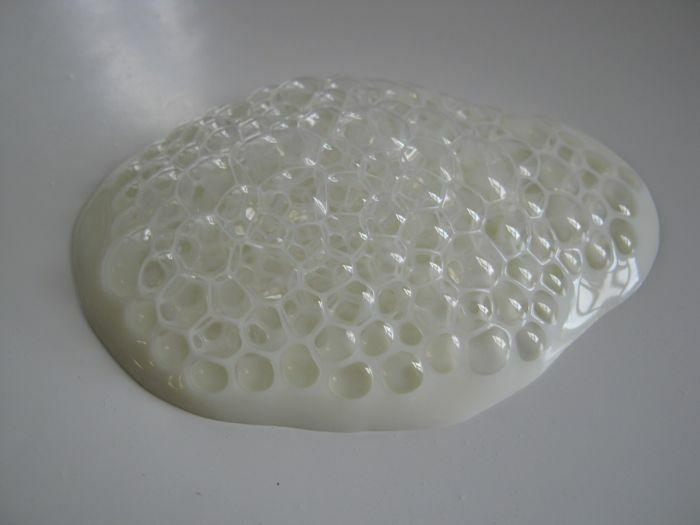 Milk consists of proteins that form a network that reduces the surface tension making allowing bubbles to form. Low-fat Milk works best. I was not able to simulate milk effectively; I tried, glycerine, and even egg white, to emulate its specific qualities. The final mixture consisted of all these things as well as paint powder. The work is perhaps better described as durational performance than sculpture, demanding a certain commitment and understanding form those who wish to exhibit it. The work needs topping up approximately every 2 hours and needs to be wiped clean regularly.